At least six people have been killed by security forces in Deraa as the Syrian government seeks to tighten its grip on the southern city, activists say. Tanks were earlier seen rolling into the city and gunfire was heard coming from the old quarter. One activist said the dead had been shot by snipers. 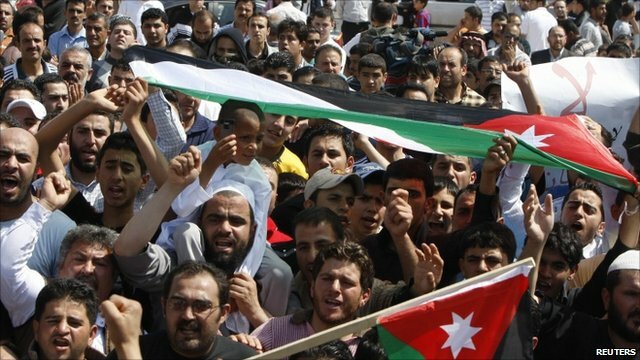 On Friday, more than 60 protesters were killed across the country – more than half of them in Deraa – activists said. Officials said the number of dead was far lower, and included four soldiers. Foreign journalists are not being allowed into Syria, and the exact picture of what is happening remains unclear. On Saturday, witnesses said there was continuing army action in Deraa. One told the BBC that soldiers were close to the city’s main Omari mosque and that he could see bodies in the street. Gunfire could be heard in the background. Later, activists said that at least six people had died. “They were killed as the army began pounding the town at dawn and snipers opened fire,” one activist told the AFP news agency. It is not known if the deaths came as people attended the funerals of the 40 people who witnesses said had been killed in Deraa on Friday. According to some reports, officials asked the relatives of those who died in Deraa and elsewhere to keep the funerals small and personal. In the past that has not prevented crowds of sympathisers turning out and chanting slogans against the regime, says the BBC’s Jim Muir in Beirut. Websites supporting the uprising in Syria have said the bloodshed will only increase the resolve of the protesters to see through the mission of those who have fallen, our correspondent says. They have called for a “week of breaking the siege” – a reference to the dire situation in Deraa, which has been in the grip of a crackdown by troops and tanks for the past six days, he adds. They are planning demonstrations in different parts of the country everyday, culminating in nationwide protests at the end of the week. Activists said it was difficult to know exactly what was happening in Deraa because residents were not being allowed to move far from their homes. “The city is besieged. Food, water and medicine are running out,” one quoted a witness as saying. Some people had tried to bring in food and medicine to the city, but they were told they could not enter the city and turned back, the activists added. Unconfirmed reports said some soldiers had deserted and were taking refuge with locals after refusing to fire on protesters in Deraa. The UK-based Syrian Observatory for Human Rights says 539 people have been killed nationwide since protests began on 15 March. 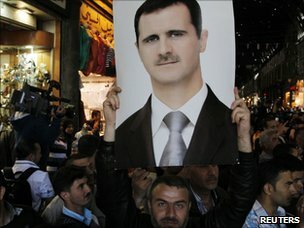 President Bashar al-Assad’s government blames extremists for the unrest, which it says have left 80 security personnel dead. On Friday, the UN Human Rights Council condemned violence, in a US-led resolution by 26 votes to nine with seven abstentions. 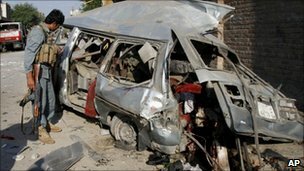 UK Foreign Secretary William Hague welcomed the resolution on Saturday and voiced alarm at the “credible” reports of hundreds of deaths. “I am extremely concerned by ongoing violence and repression in Syria,” he said in a statement. Send your pictures and videos to yourpics@bbc.co.uk or text them to 61124 (UK) or +44 7725 100 100 (International). If you have a large file you can upload here. This article is from the BBC News website. © British Broadcasting Corporation, The BBC is not responsible for the content of external internet sites. Fire crews have spent 24 hours tackling a fire covering around eight hectares (20 acres) of grassland and shrubbery in Rhondda Cynon Taf. The Taliban have announced the start of a spring offensive across Afghanistan. In a statement, the group said the fighting would start on Sunday, targeting foreign troops as well as Afghan security forces and officials. It warned civilians to stay away from public gatherings, military bases, government buildings and convoys. Meanwhile initial findings from a Nato inquiry into a deadly attack at Kabul airport on Wednesday suggest the gunman was not connected to the Taliban. The man, an Afghan pilot, killed eight US troops and a contractor. He was later found dead. The Taliban claimed the attack, but the coalition said there was no evidence for this and the gunman appeared to have acted alone. Saturday’s statement by the Taliban said the group would attack “foreign invading forces, members of their spy networks and other spies, high-ranking officials of the Kabul puppet administration”. It said the war would continue “until the foreign invading forces pull out of Afghanistan”. The Taliban have claimed a series of attacks in recent weeks – including the killing of Kandahar police chief Khan Mohammed Mujahid and a suicide bombing at an Afghan base near Jalalabad that killed five foreign and five Afghan troops. However on Friday, a Pentagon report said the insurgents’ momentum had been “broadly arrested” following a US troop surge last year. Foreign Secretary William Hague expresses concern at “credible” reports that more than 500 people have been killed in ongoing violence in Syria. Bulgaria’s agriculture sector appears to be taking off, according to data presented by the Agriculture Ministry and the National Statistical Institute. Agriculture is one of the few sectors of the Bulgarian economy with positive trade balance, according to the Bulgarian Ministry of Agriculture and Foods. In 2010, Bulgaria’s agriculture trade balance was positive USD 944 M, up from a positive USD 385 M in 2009. Judd Trump, 21, overcomes Ding Junhui 17-15 in a high-class World Championship semi-final to become the second youngest player ever to reach the Crucible final. The body of a man has been found in a flat in east Belfast. Police said they are treating the death as “suspicious” and have launched an investigation. The remains were found in an apartment in the Clarawood area of the city at 1230 BST on Saturday. The cause of death is not yet known. A post mortem will be carried out. Bulgarian nationalist party VMRO is going to stage a rally against the Jehovah’s Witnesses in Bulgaria after the two formations have been tangled in a conflict in the recent weeks. The VMRO rally will take place on Sunday, May 1, near the prayer house of the Jehovah’s Witnesses in Sofia near the Lyulin metro station. “We are against the enslavement of the human personality by religious sects and the use of religious feelings for commercial purposes that such sects carry out,” VMRO’s press center said Saturday regarding its motivation to protest against the Jehovah’s Witnesses. Rangers hammer Motherwell in the early kick-off and there are wins for Aberdeen and St Johnstone. A family of eight suffered burns and the effects of smoke inhalation when they were the victims of a suspected arson attack in Birmingham. West Midlands Police is appealing for witnesses to the fire which happened in Crompton Road, Nechells, at about 0500 BST. A fire service spokesman said a 28-year-old woman was taken to hospital with 30% burns and a broken ankle. Police said her ankle injury was caused when she jumped from a window. A man and a woman in their 20s were also hospitalised with 20% burns and a woman in her 20s was taken to hospital suffering from the effects of smoke inhalation. Four others were treated at the scene for smoke inhalation. One of the family’s pet dogs died in the fire and another was rescued by firefighters. Anyone who witnessed anything suspicious on Crompton Road around the time of the fire is asked to contact police. You are currently browsing the Business, finances, forex blog archives for April, 2011.